NEW YORK, Aug. 28, 2018 /PRNewswire/ -- The first edition of Financial Independence: Getting to Point X by John J. Vento, CPA, MBA, CFP® introduced the 10 Key Wealth Management Issues and how to bring them together in perfect harmony in the pursuit of "Point X," financial independence. 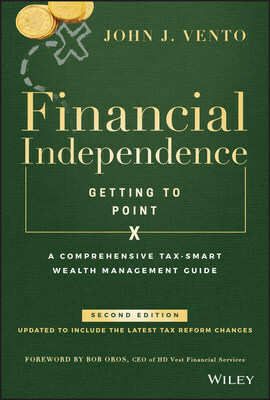 The completely revised second edition of Financial Independence: Getting to Point X is the first book to be published by Wiley covering the Tax Cuts and Jobs Act of 2017, and provides consumers and their financial advisors with the new easy-to-follow roadmap to Point X, including the latest thinking, and best practices following the ratification of the new tax reform. The second edition of Financial Independence: Getting to Point X, published by Wiley, is available for purchase at bookstores nationwide and from major online booksellers. For more information, visit: https://bit.ly/2Bb1jYX. "The Tax Cuts and Jobs Act of 2017 opened the door to the most impactful tax reform in decades, and investors and financial professionals need a clear understanding of which wealth management strategies are now obsolete and which new tax-saving opportunities are worth pursuing," said John J. Vento, author of Financial Independence: Getting to Point X. "The American Dream isn't dead—but the old ways of achieving it are. I wrote the second edition of this book to give all Americans, no matter where they are in their lives, realistic ways to save, budget, control debt, manage their investments, and minimize taxes given the new realities of tax reform." Tax Alpha to the 2nd PowerSM facts and strategies that can be applied through a tax-smart approach to all your wealth management issues. A new chapter, "Starting Your Own Business," which covers Mr. Vento's time-tested advice from his 30 years of experience helping hundreds of small business owners achieve financial independence in the most tax-efficient manner. A new section on eldercare planning, in the chapter about "Preserving Your Estate," which provides guidance on how to prepare for long-term care costs for yourself, your parents, and your grandparents. Insights and first-hand advice from a diverse selection of financial experts. Up-to-date case studies that discuss the impact the latest financial planning strategies will have on Americans in different real-world situations. Mr. Vento (http://www.ventocpa.com) is affiliated with HD Vest Financial Services®, the pioneer of Tax Smart Investing and a wholly owned subsidiary of Blucora, Inc.
"The future of the tax business involves diversifying in order to offer clients a more holistic approach to managing their finances," said Bob Oros, CEO of HD Vest Financial Services, who wrote the foreword to the updated Financial Independence: Getting to Point X. "John and our other advisors have embraced this evolution, working closely with clients to help them obtain financial independence by combining holistic financial planning with Tax Smart Investing. The second edition of John's book, like the original, goes a long way toward improving financial literacy—the first step to reaching financial independence." About John J. VentoJohn J. Vento has owned the firms of John J. Vento, CPA, PC and Comprehensive Wealth Management Ltd. in New York City since 1987. He graduated from Pace University with a bachelor's degree in business administration in public accounting, and continued on to earn an MBA in taxation from St. John's University. Mr. Vento is a certified public accountant (CPA) and Certified Financial Planner™. For additional information about John J. Vento, log onto www.ventocpa.com, call (718) 980-9000, or visit his headquarters at: 95 New Dorp Lane, Staten Island, NY 10306. John J. Vento, CPA, PC and Comprehensive Wealth Management LTD are not registered broker/dealers or registered investment advisory firms. Securities offered through HD Vest Investment Services®, Member FINRA/SIPC, Advisory services offered through HD Vest Advisory Services®, Insurance services offered through HD Vest Insurance Agency LLC. 6333 N. State Highway 161, Fourth Floor, Irving, TX 75038, 972-870-6000.